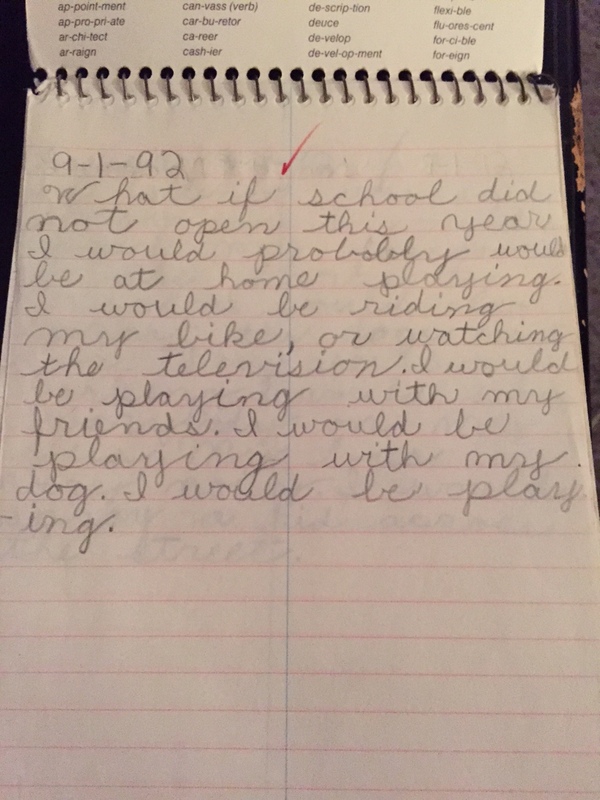 What did living my best life look like in second grade? Apparently it involved roller skates. 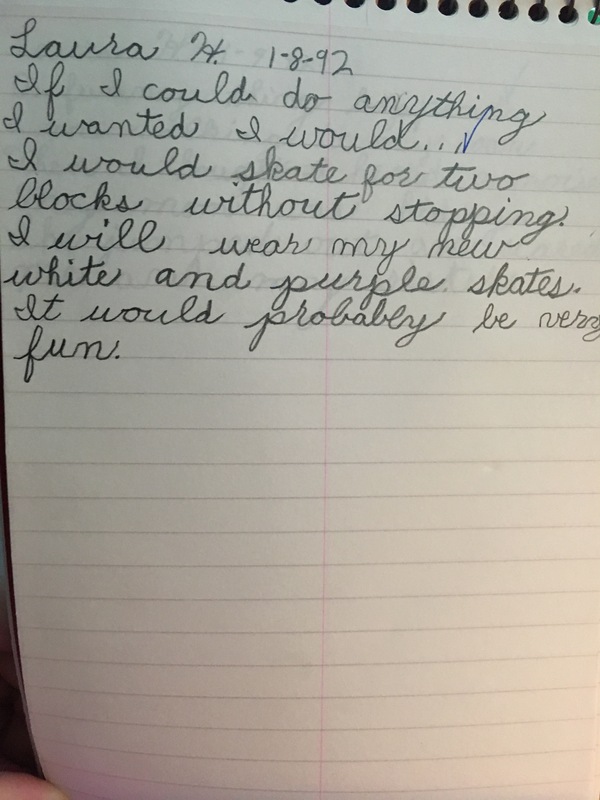 And working toward that elusive two block adventure..
Can we also pause for the cause a moment though and appreciate how good I was at cursive at age 7 and a half? 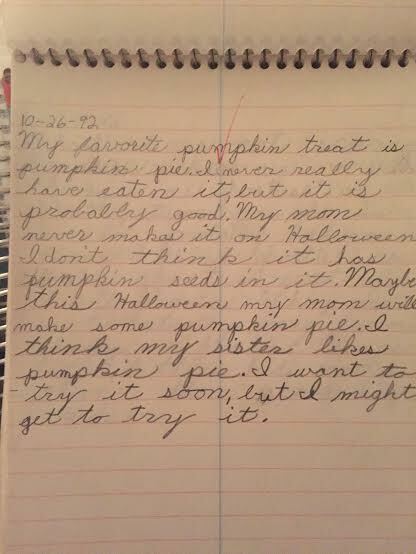 Third-grade Laura is a damn liar. This does, however, document my first attempt at bullshitting an assignment – a trend that continued well through college. Ohhhhhh you guys. Have I got a treat for you. My parents are attempting to clean out some of the million boxes of things in their basement, which includes giving us kids some of our old stuff they’ve kept. A couple weeks ago, I collected one box from ’em – with such gems in it as Rachel’s lava lamp (whoops), my A Knight’s Tale poster (R.I.P. Heath Ledger) aaaaaand, a notebook of mine from third grade. There are some GLORIOUS entries in there, which brings us to this new feature here on the blog for TBT. We’re going to take a walk down memory lane and revisit the beginnings of my career as a writer. You can see the talent even then. You would be playing. WE GET IT, DAMN. Also: Look at that phenomenal penmanship. Thanks, Mrs. Kleinhans! So cleaning month is going pretty well. So well, in fact, that it will have to continue into the next month because I still haven’t tackled that guest bedroom closet yet. 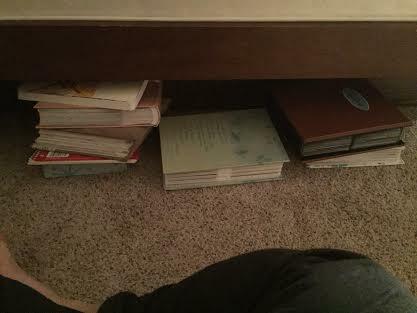 Anyways, this is not about what I haven’t cleaned, but what I HAVE. You already saw the closet and clothes overhaul-type thing. I also had two nightstands I had to clean out…one of which I haven’t even looked in since I moved in (A year ago, today, in fact, woot!). It proved to be a treasure trove of sorts. 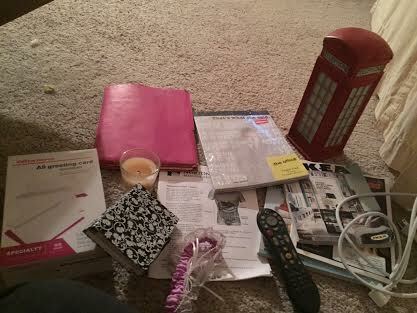 I found lots of pictures, perfect for #tbt possibilities, and essentials like my garter from prom 13 years ago, entirely too many unused legal pads (#writerprobs), a small London phone booth decoration, TiVo remote for a system I no longer have, and hospital information for post-appendectomy life. 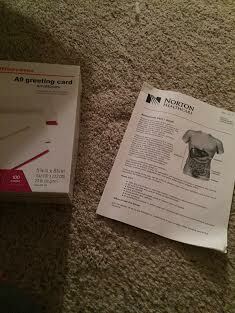 Post-appendectomy life is very gassy. Other than that, relatively normal. It’s time to part with the paperwork. That was a couple weeks ago. 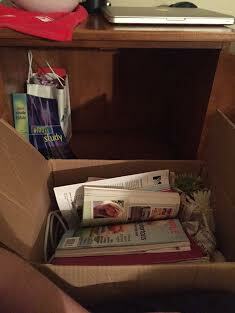 And I cleaned out a box’s worth of crap. Most of the stuff in those pictures was tossed, including that folder, from a Feature Writing class in college where I had a professor who once made me decorate her Christmas tree and claimed she could feel earthquakes before they happened. In Kentucky. Speaking of crazy. Did I mention the month of May is? So just because I haven’t been home doesn’t mean I haven’t been cleaning. I’m on a delete spree, guys. I have entirely too many emails I don’t need in my email inbox taking up space. I have people’s phone numbers I talked two twice and/or not for years now. I have texts from two years ago, thanks iPhone. I have annoying Twitter accounts I follow. Still a bit in the process with that one, in fact. Like today, when, in honor of one year of home ownership, my AC stopped working and I didn’t feel like moving cause I was a puddle of sweat, I deleted doubles of photos on my phone, apps I haven’t used since downloading, files I don’t need off my computer (which is still saying it’s about out of storage space). See, you can still be productive when you’re having a “lazy” weekend! There is hope! Not to mention I feel guilty on days I don’t do anything at all, even if they are really few and far between. But this cleaning (and realizing today that I’ve been in here a year) has led me to my next month of this project, that I’ll start soon…and I’ll give you a hint about what that is. It involves my condo. I’m sure this has been suuuuper exciting for y’all to read about, but I promise, it’s made me happy and my house more comfortable and better looking. So there’s that. Any of you done any major cleaning sprees lately? Spring cleaning and whatnot? Find anything good?